The most recent distribution was given in April 2014 in the amount of $0.07. Morningstar analysts rank this PIMCO All Asset All Authority fund with 2-stars and Silver ratingSince the inception in 2003, this fund has returned in 6 years of positive return. It has its best 1-year total return in 2009 (18.65%). Based on the load adjusted returns, it has returned 3.70% over the past 5 years and 4.92% over the past 10-years. This load fund is available for purchase through 106 brokerages, such as Scottrade, E TRADE Financial, Schwab Institutional, TD Ameritrade, Matrix Financial Solutions, etc. The minimum initial investment is $1,000. The top holdings as of November 2014 are PIMCO StocksPLUS AR Short Strategy Institutional, PIMCO Income Institutional, PIMCO Emerging Local Bond Institutional, PIMCO Emerging Markets Currency Institutional, and PIMCO Worldwide Fundamental Advantage AR Strategy Institutional. Top 3 sectors are consumer defensive, energy, and financial services. 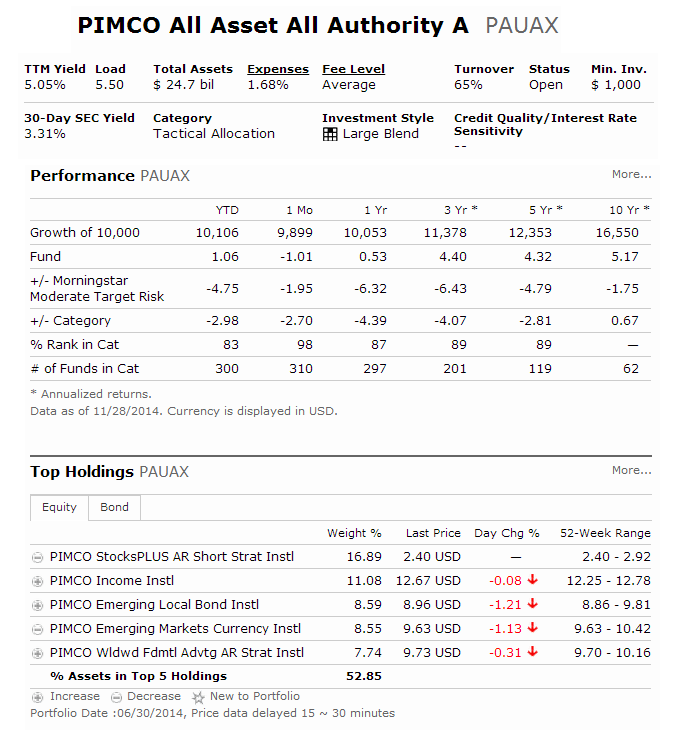 According to the fund’s website, the principal risks of investing in this PIMCO fund are market risk, interest rate risk, credit risk, investment style risk, income risk and derivatives risk.